Yaddo was the country estate of financier Spencer Trask and his wife Katrina, a writer. The name “Yaddo” is attributed to their daughter Christina. The first settler on the property was Jacobus Barhyte, a Revolutionary War veteran, who operated a tavern and gristmill. The Trasks arrived in 1881. Ten years later, their house burned, and the Trasks hired architect William Halsey Wood to build the Queen Anne Revival Mansion that now stands. Left without immediate heirs by the deaths of their four children, the Trasks bequeathed their fortune and estate to the establishment of a residency program for artists. They founded the Corporation of Yaddo in 1900. 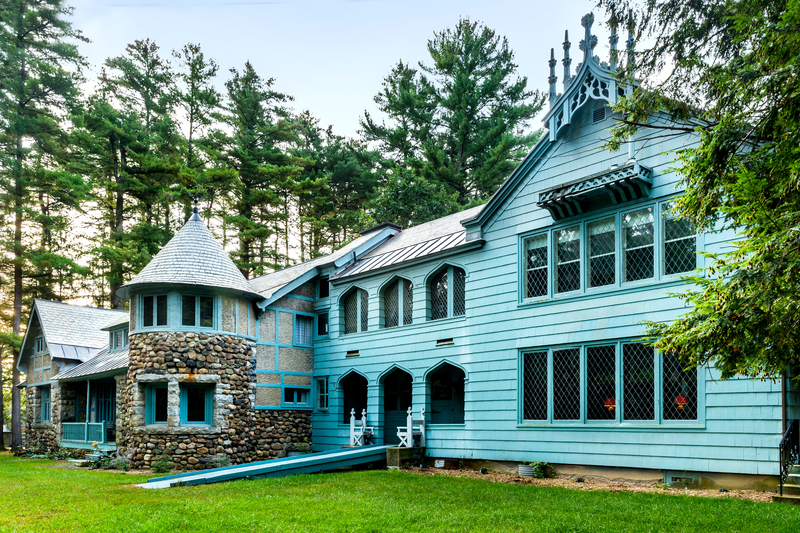 In their letter of intent, they expressed the hope that Yaddo be a place of “rest and refreshment [for] authors, painters, sculptors, musicians and other artists both men and women, few in number but chosen for their creative gifts.” Yaddo opened its doors to its first group of guests in 1926. By that time both Spencer and Katrina had died. Guests were welcomed by George Foster Peabody, Spencer’s business partner and Katrina’s second husband, and Elizabeth Ames, Yaddo’s first executive director. The Trasks’ legacy has been profound. John Cheever wrote that the “forty or so acres on which the principal buildings of Yaddo stand have seen more distinguished activity in the arts than any other piece of ground in the English-speaking community and perhaps the world.” Collectively, Yaddo artists have won 74 Pulitzer Prizes, 29 MacArthur Fellowships, 68 National Book Awards, and a Nobel Prize (Saul Bellow, who won the Nobel for Literature in 1976). Notable Yaddo artists through the turn of the millennium include James Baldwin, Leonard Bernstein, Truman Capote, Aaron Copland, Philip Guston, Patricia Highsmith, Langston Hughes, Ted Hughes, Jacob Lawrence, Sylvia Plath, Martin Puryear, Katherine Anne Porter, Amy Sillman, Clyfford Still, and David Foster Wallace. More recent guests include Terry Adkins, Laurie Anderson, Jeffrey Eugenides, Sheri Fink, and Matthew Weiner. The Trasks were known for their civic spirit. To show their appreciation for the Saratoga Springs community, Katrina Trask began a tradition in 1912 of presenting the Yaddo Medal, crafted by Tiffany & Company, to a young man and young woman in the graduating class at Saratoga Springs High School who demonstrate academic achievement and character. The tradition continues to this day. For more about the history of the Trasks and Yaddo, please consult Yaddo: Making American Culture, edited by Micki McGee (New York: Columbia University Press, 2008). Our institutional archive, which encompasses artist guest files through 1980, is located in the Archives and Manuscripts Division of the New York Public Library in Manhattan. The finding aid is available online here. Research inquiries should be directed to the library.